A MEGADROUGHT in parts of Africa and Asia about 17,000 years ago led to mass migration of humans and animals. It is regarded as the most severe in the last 50,000 years. Rainfall in this drought-hit region is caused when winds from the northern and southern hemispheres converge ne-ar the equator. This area is called the In-tertropical Convergence Zone (ITCZ). Till now it was believed the mega-drought was caused because the zone shifted southwards. But researchers at Paul Smith’s College, New York, reckon that many other forces were at play. The team used radiocarbon dating and fossilised algae records from lake Victoria and lake Tanganyika, which lies south of the former. They found that the drought dried up lake Victoria in east Africa, the primary source of water for the Nile, and lake Tanganyika, the second longest fresh water lake in the world, in Tanzania. Based on this, they reasoned that the zone’s shift southwards would have brought rains to the equatorial region once or twice annually. The spread of this drought would have happened only if the ITCZ had shifted at least 20 degrees south from the equator, researchers pointed. A smaller shift would have increased water content of lakes like Tanganyika, Malawi, Zambezi and Limpopo. The zone’s shift was minor, they concluded. J Curt Stager and team from Paul Smith’s College link the drought to the Heinrich Event 1 (H1)—atmospheric cooling caused by breaking icebergs and melting glaciers in the north Atlantic. The event that occurred at the same time as the drought, disturbed ocean currents and reduced rainfall in the Sahara desert and the African savanna. 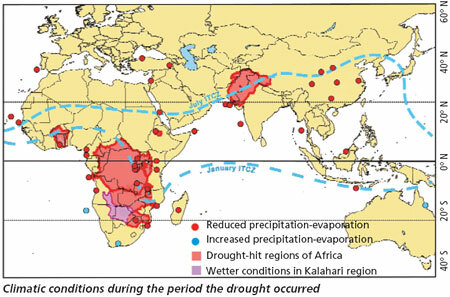 In the February 24 issue of Science, Stager said Afro-Asian rainfall declined as sea surface cooled due to the H1 event. This is linked to the weakening of atmospheric circulation over east Africa during H1. Similarly, cooler sea surface temperatures in southeast Atlantic and Indian Ocean could be behind the re-duction of rainfall. “By showing how widespread and severe this drought was, we have shown that the earlier suggested cause of drying needs to be re-evaluated. The findings will help scientists understand better what people, cultures and ecosystems went through at that time,” said Stager. “The study by Stager improves an understanding of spatial and temporal responses of low-latitude monsoon systems. Even though there are major differences in the Earth system between the time period they studied and today, kn-owing that changes in the monsoon system have affected a large area is important,” said John A Peck, associate professor, sedimentary geology, University of Akron, Ohio.